Out-of-the-box the WordPress function wp_dropdown_pages() does not support the multiple attribute. Luckily it’s not that hard to do and even better: you don’t need to do too much hacking to achieve this. 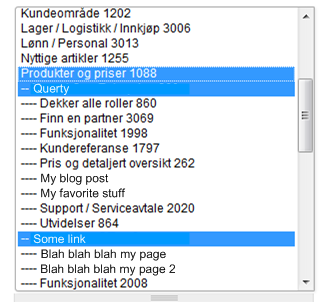 Select list with multiple selected items generated with the wp_dropdown_pages() function. The codex does not mention the walker option but it is possible to pass a Walker object in the wp_dropdown_pages() argument list. We will need to customize the Walker object in order to get the functionality we want. When customizing the Walker implementation we simply extend the original Walker_PageDropdown class and do slight adjustments to it so it will respect multiple selected values. The theme file functions.php could be a good place to define the class; or even in its own plugin. * Create HTML dropdown list of pages. * @param int $depth Depth of page in reference to parent pages. Used for padding. * @param array $args Uses 'selected' argument for selected page to set selected HTML attribute for option element. Now you’re all set to use the wp_dropdown_pages() function with multiple selected values. Bonus feature: You can change the “padding” string with the unofficial pad option. In my implementation it defaults to two hyphens per level (–). This entry was posted in Wordpress and tagged HTML dropdown list, Walker class. Bookmark the permalink. ← My acne is gone, have I become a happier person?